Tag line: "The supreme triumph the world has ever known in the Motion Picture Industry"
Anyone with a basic knowledge of film history will have heard of 1927’s The Jazz Singer. 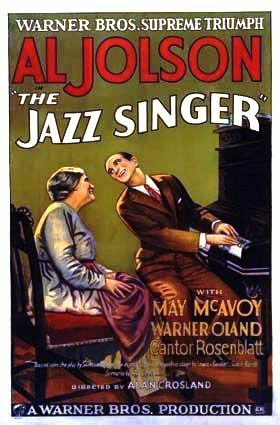 The first motion picture to feature synchronized dialogue, The Jazz Singer single-handedly ushered in the era of the “talkies”, making it one of the most influential movies ever produced. But as I sat down to watch it this evening, I found myself wondering how effective the film would be all these years later. Was The Jazz Singer still a time-honored classic, or merely a museum piece, a relic of the past that, somewhere along the line, lost its edge? For five generations, a member of the Rabinowitz family has served as the Cantor of their New York City synagogue, and the current Cantor (Warner Oland) is preparing his son, Jakie, to follow in his footsteps. But Jakie doesn’t want to be a Cantor; a fan of jazz music, he intends to sing and dance on stage, in front of a live audience. When, at the age of 13, Jakie (played as a boy by Robert Gordon) is found performing in a local beer hall, his father drags him out by the scruff of his neck and, once home, whips the poor boy, telling him that, whether he likes it or not, he’s going to be a Cantor. Though he knows it will break the heart of his beloved mother (Eugenie Besserer), Jakie defies his father and leaves home, vowing never to return. Ten years pass, and Jakie (Al Jolson), who has since changed his name to “Jack Robin”, is an up-and-coming jazz singer, waiting for his big break. During a cabaret performance, Jack catches the eye of Mary Dale (May McAvoy), a dancer, and with her help he’s soon headlining a musical revue. Eventually, Jack is offered a job on Broadway, and once in the city, he stops in to visit his parents. Though his mother is overjoyed to see him, Jack’s father, still angry all these years later, remains distant and cold. In spite of his father’s attitude, Jack has no intention of turning his back on his budding career, but when a crisis arises, he must decide what’s more important to him: family tradition or the cheers of the crowd. Despite being the first-ever talkie, The Jazz Singer is, for most of its running time, a silent picture. It isn’t until Jolson sings “Dirty Hands, Dirty Face” on-stage that we get our first bit of synchronized sound (two earlier musical numbers, including Jakie performing in the beer hall at age 13, were recorded after the fact, and are therefore not synchronized). Moments later, Jolson utters the immortal line “You ain’t heard nothing yet”, then belts out a spirited rendition of “Toot, Toot, Tootsie (Goo’Bye)”, and with that, the era of sound was born (as good as this early sequence is, the film’s best moment is when Jack, home for the first time in years, sits down at the piano and serenades his mother with a couple of songs). Yet as interesting as its musical numbers are, The Jazz Singer is even better as a family drama. The scene where Jack returns home will surely move you to tears, as will his attempts to reconcile with his father, who stubbornly refuses to acknowledge that he even has a son. In fact, I have to admit that I was choked up for most of the film’s final act! 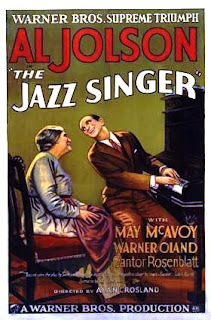 Aside from a few unfortunate scenes in which Jack, in blackface, performs on-stage (including the now-infamous “Mammy” finale), The Jazz Singer remains a shining example of Hollywood in its pioneering days, and while its various innovations were indeed groundbreaking, it’s the story, as well as the fine work of its talented lead, that makes The Jazz Singer a classic. This one has been on my watchlist forever. I need to go ahead and watch it, already. I don't know...I don't consider it as "unfortunate" that the infamous Mammy routine is in blackface. However, I do think it's unfortunate that it's mostly what we remember. Unless we think of Neil Diamond's version, which would use words that haven't been invented yet for unfortunate. I can't deny it--I do love its 70s sensibilities. I'm sure you've gotten this before, but how do you do it?! Wow!